In Excess needed Hampshire Mezzanine Floors to provide additional storage and work areas utilising the wasted space in their timber storage unit. 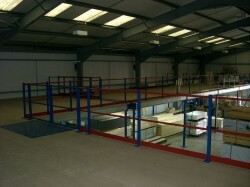 Hampshire Mezzanine Floors provided three layout options which helped In Excess plan their final requirements. The large mezzanine floor, which covered a 250m 2 area, included 2 number staircase and two number large swing gates which allowed the client’s timber stacks to be positioned on the mezzanine. The mezzanine floor was designed to hold pallets up to 4.8 kN/m2 and was installed in 4 days with minimum disruption to the client. Hampshire Mezzanine Floors provided structural calculations so the client could organise the building regulations themselves, at their request. In Excess, located across the Southern counties are market leaders in providing a wide range of quality household products at discount prices, including DIY, hardware, timber and garden products. Hampshire Mezzanine Floors look forward to working with In Excess again in the future and are proud of their latest installation. HMF have vast experience in project managing large jobs as Main Contractor, minimising disruption to your business and saving you considerable costs by using competitive systems. Hampshire Mezzanine work mainly in industrial warehouses, factories, retail and trade premises as well as offices and provide Mezzanine Floors and many more services in England, Wales, Jersey Guernsey, Channel Islands and counties including Hampshire Dorset Berkshire Surrey Wiltshire Oxfordshire East Sussex Kent London West Sussex Gloucestershire and Middlesex. Mezzanine Floors are the perfect solution to maximising the space you have available in your premises, be it Storage, Office, Production or Retail Mezzanine requirements. 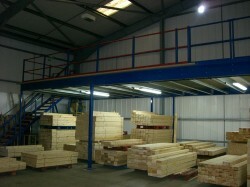 Contact HMF now for all your UK Mezzanine Floor requirements.